Charles W. Howard’s professional career is that of a legend. He first played Santa as a boy in a classroom play. As an adult he found himself asked to help out a friend and play Santa in a store front window in downtown Albion. This experience helped Howard’s urge to perfect the role of Santa Claus as much as he could. In his early career Howard caught the train next to his farm in Albion and commuted to Rochester and then Buffalo to be Santa in department stores. It was about this time he started to develop the idea for a “school” for Santas. Howard’s first school was in the fall of 1937. Howard also appeared in the Macy’s Thanksgiving Day Parade from 1948 through 1965. Oddly, he never worked as Santa in the New York City flagship store. 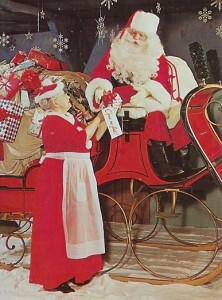 From 1948-1964, Howard flew from New York City to Kansas City, Missouri to be the Santa at the Macy’s store there. In 1965, his last Christmas season, Howard worked at Nieman Marcus in Dallas, Texas.